After 2 years in India, Jon moved on to Vietnam and has lived there ever since, with an independent furniture making business of his own since 2004. Starting with just 10 people in a small factory, Jon has now built a business of more than 1,000 craftsmen (and women - in fact mostly women!) all of whom are well trained artisans capable of producing top quality furniture to the highest possible global standards. Jon loves to keep pushing the boundaries of the business, and particularly enjoys exploring new methodologies and materials. Some years ago, for example, Jon designed an oyster secretary cabinet which was so ornate that hardware from his regular suppliers could not do it justice. The only solution was for the factory to make the hardware from scratch and from that day onwards all brass and bronze fittings on Jonathan Charles furniture has been made in the foundry on site within the factory - something which makes Jon very proud. At the heart of any great company are great people. Jonathan Charles values people as the highest asset of the company and recognizes that without the dedication, work ethic, enthusiasm and commitment to qualify of the workforce, our company would not be the success it is today. As craftsmen, it is the skill of our workers and their dedication to qualify and fine workmanship that gives Jonathan Charles our competitive edge in a global marketplace. 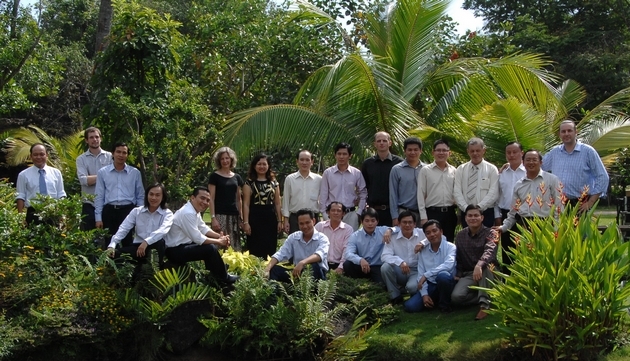 We have a team of 16 Vietnamese Managers and 6 Foreign Managers, Director and Specialist. Each of one has a commitment to continuously improving our Corporate Culture and our employees’ success with the company. Combined, they have a total of 306.5 years experience in their specialist areas giving us a wealth of experience and knowledge that we want to pass on to you. Jonathan Charles is a successful, dynamic and modern business organization with a team of highly motivated young people with initiative that have been selected for professionally training. We are continuously looking for dynamic, highly motivated, positively career-oriented, hardworking and ambitious people to develop our company’s organization and structure. We are firmly committed to developing a management structure that consists of the best Vietnamese managers available, capable of working with European and American managers with a single focus of maintaining our company’s status as the best exporter of high-end furniture in Asia.